According to the Wall Street Journal, passengers on Southwest Airlines flight 1380, which suffered an engine failure and broken window, didn’t use their oxygen masks properly. Some passengers only put the mask over their mouths (as you can see in this photo) -- even though everyone has heard the instruction to “put the oxygen mask over both your mouth and nose” countless times. That 30-second demo of how to put the mask on properly is such an insignificant portion of most of our lives. Having to use the oxygen mask for the first time amid all that chaos and the turbulence and fact that there was huge hole out the side of the window made it very difficult. That sounds about right to me. Airlines and regulators can’t get passengers to follow instructions because it’s absurd to expect them to remember what they’re supposed to do in such a terrifying situation no matter how many times you’ve told them. Leaving aside the panic that clouds rational thought (OH MY GOD I’M GOING TO DIE! ), virtually no one has had the experience of using a mask during a flight. 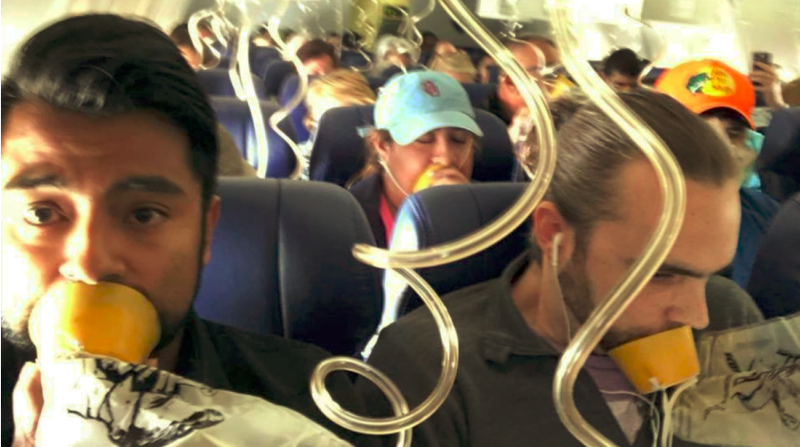 Moreover, passengers don’t even practice using the oxygen masks during pre-flight instructions. With no kinesthetic training to support the flight attendant’s instruction, it’s highly unlikely that people will do it properly. Manufacturers of modern defibrillators understand this—that's why there’s a step-by-step audio recording when it’s activated explaining how to use it. Given this reality, the pre-flight instruction is about as silly as all the warnings we see in workplaces to just “be more careful.” And based on this Southwest Airlines accident, it’s about as effective. I’m sure that there are better brains than mine working on this problem, but one simple idea would be a version of poka-yoke. Take a look at the opening of the standard airplane oxygen mask itself: it’s a circle. There’s nothing in the shape that indicates it should go over the mouth and nose. If anything, the symmetrical shape makes it looks like it should just go over the mouth. It seems like a pretty simple and inexpensive solution to a potentially serious problem for the passengers. And not having to remind people how to use the masks would free up the flight attendants’ time to deal with other issues in the emergency.